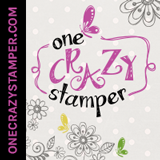 Both ladies have won a $25 gift certificate to the One Crazy Stamper store. Please email Lora (sinkler-lake at rogers dot com) to claim your prize. Our next challenge starts January 7th with a very special new release preview and another gift certificate up for grabs! 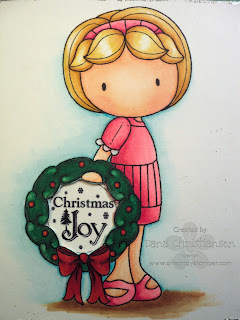 In the meanwhile, if you aren’t already a follower of this blog, become one and hop over to my blog for a chance to win this stamp set sponsored by OCS! Today I have an adorable image from Your Next Stamp: Fhiona and friend penguin. I colored the focal image with copics and cut her out with a circle nestie. I airbrushed the background and added a bow from my stash. DP is Websters Santa/Sweet Season. Hello all! We finally got our first snowfall of the season! I was wishing for it to be before Christmas, but it was the day after…close enough! Hopefully everyone is having a Happy New year. Don’t forget we will be having our next challenge over at One Crazy Stamper the first of January.I can’t wait to see what’s in store! Can you believe that 2011 is almost here??!! This will be my very last post for 2010. I hope you all had a wonderful holiday enjoying time with family and friends. You may even be on a Ski vacation like our friend Ski Bunny Trevor, who is on the slopes sporting his new Christmas attire. Santa was very good to him and his Grandma knit him a cozy sweater with a matching scarf to keep him warm. This stamp is just the cutest and quickest to bring to life. I've had him coloured for quite a while just itchin' to put him to paper. to give the snow some sparkle. Instead of using my Spellbinders "Labels Eight" to cut out the image, I used a trimmed negative for a frame, matted it with red cardstock and punched an MS Border Punch down the right hand side. This was all mounted on paper from 6" x 6" double-sided paperpad from Webster's "Santa/Sweet Season" and then put on a black card base. Another tree and two snowflakes joined together with a Rhinestone were popped onto the frame with foam dimensionals. Hope you enjoyed my little card as much as I had fun making it. Hi, it's Dana again with one last card to share with you for this month! I hope everyone enjoyed their holiday and you are resting up. Since Christmas has just passed let's pretend Christmas Emma from CC Designs is taking down the holiday decorations. The image was colored with Copics. I added some glitter around the edge of the image panel just to give it a little more glitz. The ribbon is from my stash but I thought it added just the right touch to set off the gorgeous shade of my American Crafts textured cardstock. Mine happens to be "Moss". Also make sure to head over the OCS store for all the great deals Lora has in store for you!! We've had a ball looking at all of your gorgeous creations in our very first challenge and want to thank all of you for making it a success!! I have a clean and simple card to share today. I'm loving the Flourishes set Beauty Within. I mis-stamped an image, and if you know me, you know I don't like to toss anything!! 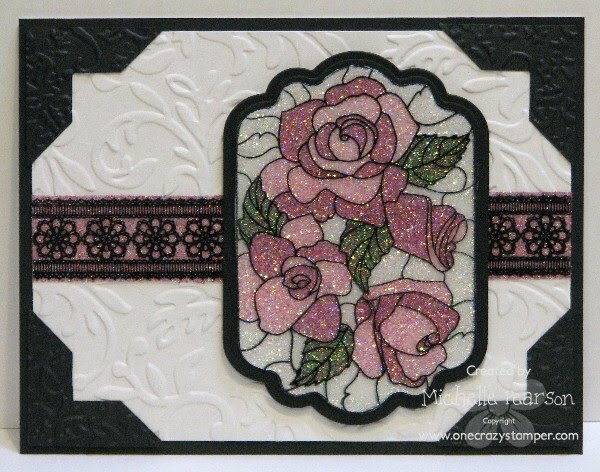 So, even though I mis-stamped my image on the scrap acetate, I decided to salvage the rose and cut it out of the image to use as my focal point. 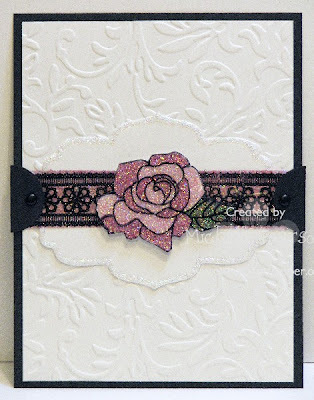 I had an extra piece of the Technique Tuesday lace border that I had glittered for last week's card laying handy on my desk....so I decided to go with a clean and simple card with the same elements. I cut a Spellbinders Labels Five die down to frame my rose and glittered the edge with Art Institute glitter. I used the Victoria Cuttlebug embossing folder for an elegant backdrop for my rose. Happy New Year Wishes to you all! Merry Christmas everyone. Hope Santa was good to you all. For my post today, I am doing a variation of the card that I did the for the challenge this month. For today's card, I did it as a shaped card. Everything that I used today can be found at One Crazy Stamper and don't forget to enter our challenge, the deadline is New Year's Eve. Looking forward to seeing who our first winner will be. Hi all and a VERY Happy Holidays to everyone! 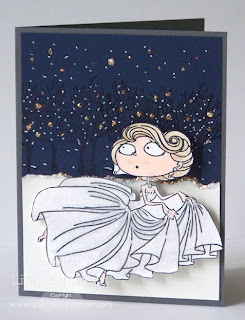 I love that Cinderella is so wintery! Fits right into our challenge (you only have a week left--at the top there is a link for you to join in). ﻿I made a snow globe off of a tutorial on splitcoast. this was my VERY FIRST one so it was a lot more cutting then I am used to but still pretty easy to follow along. I used Design paper from Basic Grey and I used circle Nestabilities. I also colored her with copics (I know, surprise, surprise :) ) I will keep this short today so you can all enjoy time with your families!!! 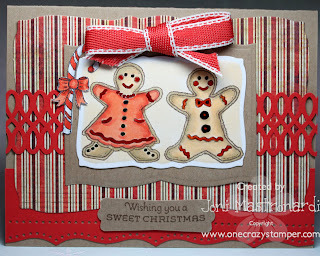 Today I have the adorable gingerbread people from the Flourishes stamp set Sweets of the Season. I colored the ginger people with copics: E30, E31, E33 and R22, R24 and added some red and black gel pens for accents. Dp is Basic Grey Jovial. I cut out the focal images with Spellbinders Label 7 And Label 8. All of the items that I have used today are available at One Crazy Stamper. Check it out! Merry Merry Christmas Eve and I hope you have a sweet sweet Christmas! Don’t forget to swing by One Crazy Stamper for some great Bargains! Sale only goes til’ Dec. 31st. Popcorn the Bear is jumping ahead a little to wish you all a Happy New Year! 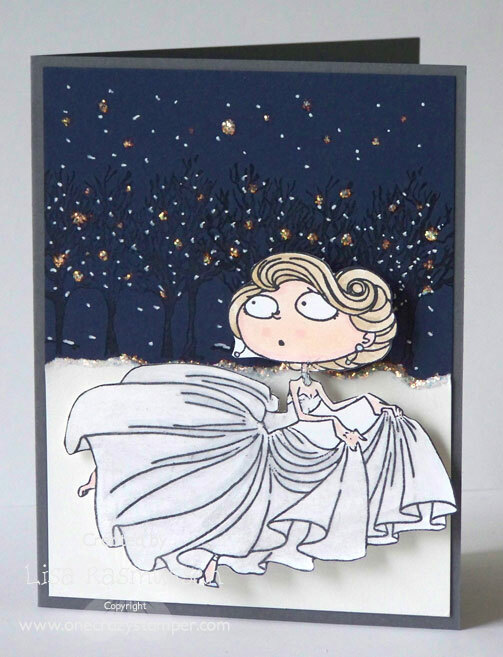 I love this little image of Crafter's Companion Golfer Popcorn. OCS has so many of the "Popcorn" sets to choose from stock, you’re sure to find one to suit a card for anyone. I found that he was so easy to color and hardly used any color at all, keeping him light and sunny looking. The Happy New Year letters were punched and mounted on a sign that was sized to fit between his arms. (I cut off the golf clubs and poked two holes in his hands to insert the twine to hold the sign. Glossy Accents was used to stabilize the letters. Misc: (snow) Frost Ultrafine glitter, ribbon and DP from stash. I want to wish everyone of you who celebrate Christmas a very “Merry Christmas” to you and yours . May the holidays give you time to spend with family and friends. ﻿This adorable little guy from CC Designs is "Christmas Trevor". He was stamped with Memento Tuxedo Black Ink and colored with Copics. I have him sitting on a circle nestie that's been inked with three different shades of Tim Holtz Distress Inks by Ranger. 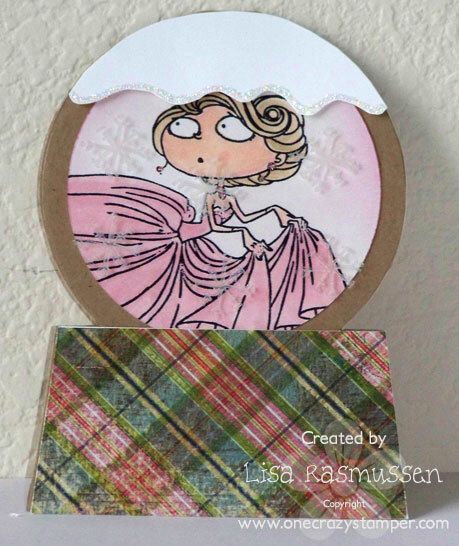 That gorgeous patterned paper is from Kaiser Craft and is called "Cabbage Patch Spring Green". (I've added that spattering of paint). Don't miss out on our challenge this month and all those great sales Lora is having at the store. A little elf told me she is really stocking up for Boxer Day!! From all of us, to all of you have a very Merry Christmas!! My card today is the second part of the tutorial that I am presenting this month. 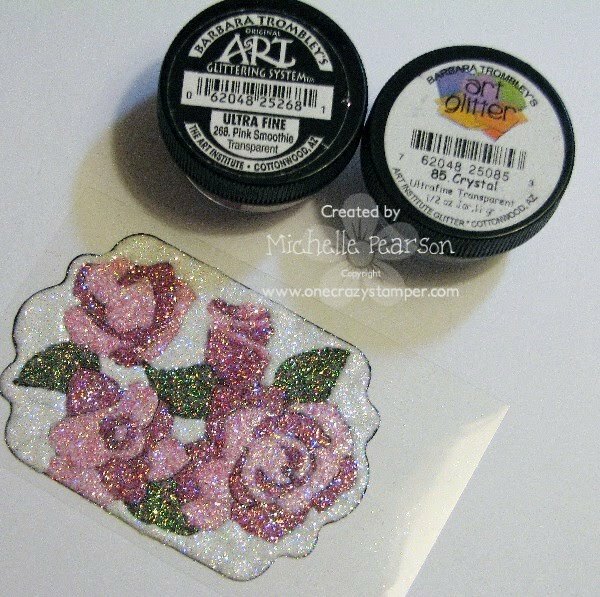 Last week my Cardinal Scene card featured the Glitter and Acetate Technique in an easy version that I just walked you through. Today's card features the technique the way I originally learned it...as well as a touch of the technique I showcased last week! First of all I am using the gorgeous set by Flourishes called Beauty Within. This set has two images that are perfect for this technique which look like stained glass. What is extra-special about this set is that it is made to coordinate with Spellbinder's Labels Eleven dies. Other items on this card include a set from Technique Tuesday called Vintage Lace, the Victoria Cuttlebug embossing folder and the beautiful Art Institute Glitters. When I do the technique this way, I use the Art Institute Dries Clear Glue and the metal tip for precision gluing. First I add the darkest colors of glitters to the back of my image. Next I add the lighter colors of glitter. This is the opposite side, you can see the darker colors are drying and once the piece is dry you can assemble your card! 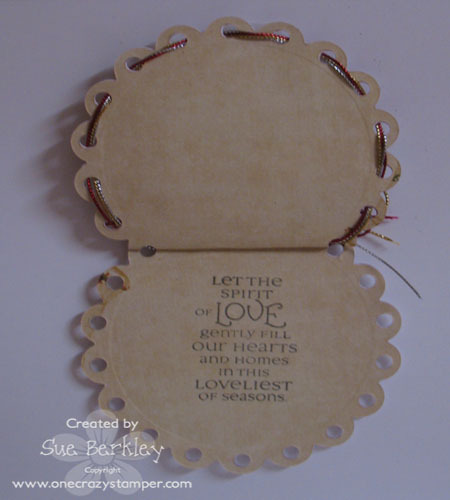 The ribbon stamp is stamped on acetate, run through the Xyron machine and then glittered. 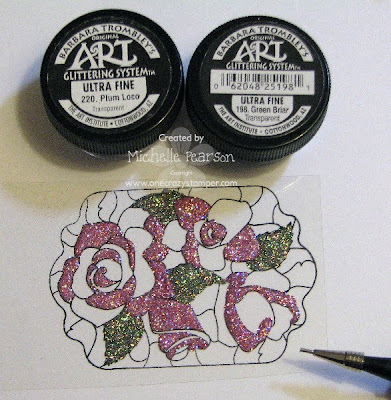 This is the easy way to glitter when you are only using one color of glitter! Be sure to check out our challenge....there is an awesome prize up for grabs! ....and some generous blog candy for a new follower to our design team blog! Give yourself a chance at some stamping goodness this holiday season!! I don't post to this blog as it is reserved just for my DT but giving it is the season to be "Jolly" I thought I might just sneak in to say HELLO to all of you. 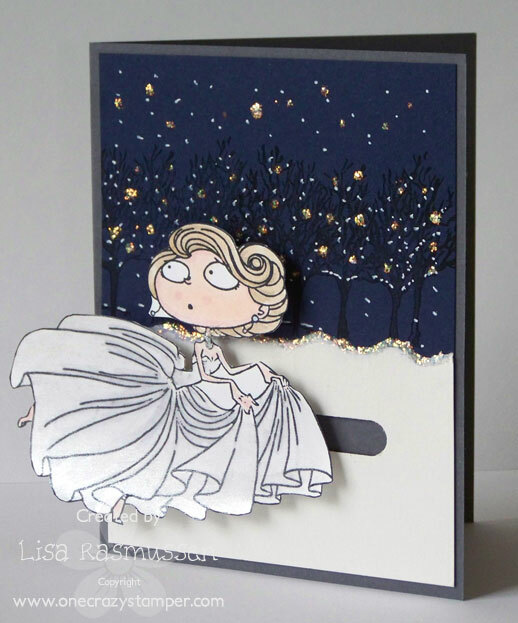 My Design Team & Guest DT have been doing an AMAZING job with their cards & projects haven't they!!!! I see lot's of uploads for the Winter/Christmas challenge...would love to see MORE. There is Blog Candy up for grabs...come post for the chance to win!!!! 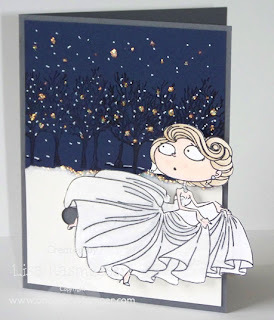 I do have a personal blog at http://www.crazystamper.typepad.com/ and today I posted my first card in over 2 month's. This is a sneak peak, the rest of the details are on my blog. On another note the FINAL YEAR END sale is up on my website at http://www.onecrazysamper.com/ this sale will run until December 31st, 2010 at midnight or while quantities last. I take this opportunity to thank each and everyone one of you a Happy Holiday & Joyous New Year!!!! We have a lot in store for you for 2011 so please keep visiting us! 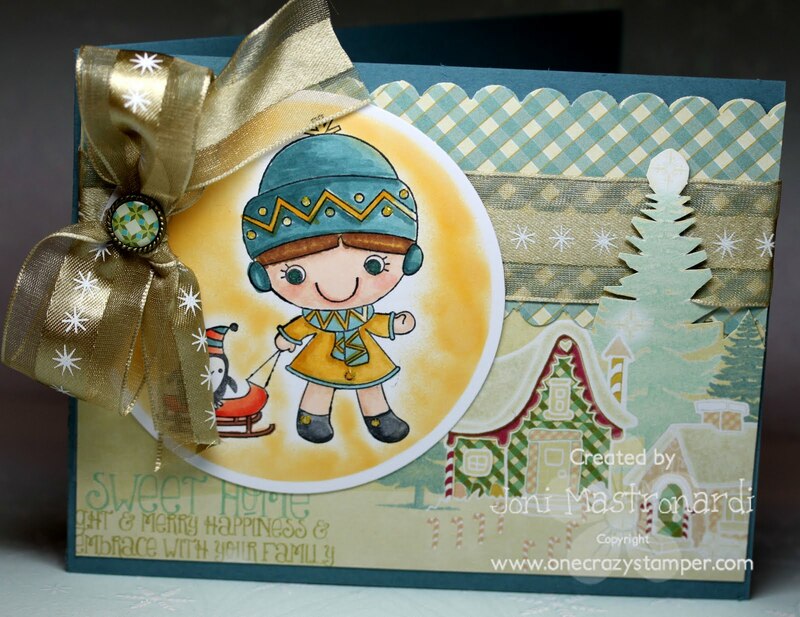 Hi Everyone and welcome to One Crazy Stamper's Blog. For my card today, I used this cute Popcorn Bear that is available at Lora's store. 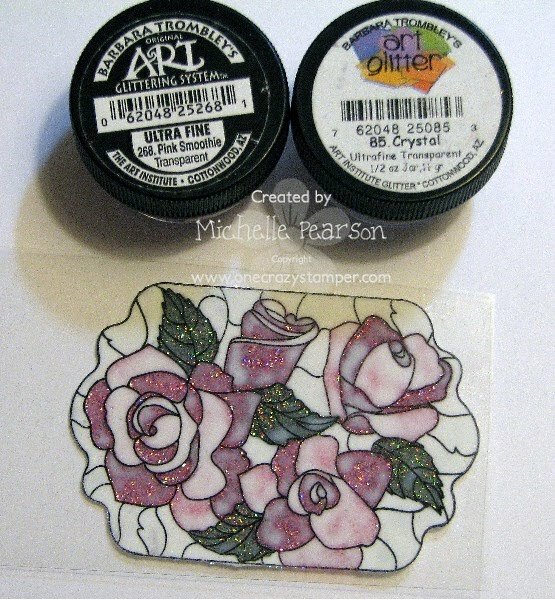 Most of the materials I used are available at One Crazy Stamper. Don't forget about the challenge going on until the end of the month! Christmas/Winter themed! Ever since I saw this Kraftin Kimmie Cinderella stamp at One Crazy Stamper I wanted her to move....It just felt like she had to. I colored her with copics and watered down some shimmery paint and painted her dress so it sparkles a lot in person. The trees are stamped with some unknown tree stamp I had in my stash and I used a white pin and stickles (Icicles) to make it look snowy. I also used stickles on the makeshift paper hill. Here is the basic picture head on. Here is a picture when she is all the way to the left and she can spin and move just by pushing her. Here she is all the way to the right. This is my first spinner card and it was fun and super easy to do! I loved how she moves and think this is a great interactive card! She wasn't that hard to cut around either. Her neck is very thin and started to get flimsy and I was worried about it ripping so I took the stickles and put it on the back of her neck in a thick line and let it dry and that seemed to be a pretty good/quick/easy fix to give her neck some strength. Don't forget about the challenge going on until the end of the month! Christmas/Winter themed! I think Cinderella fits right in! 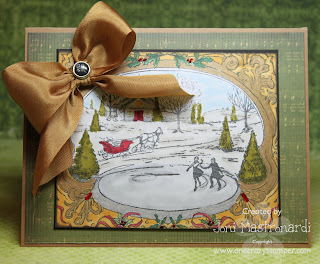 For my card today, I couldn't resist this beautiful scene from Flourishes Christmas Postcard. I colored the scene with copics (pictured below). You can purchase all of the below supplies at One Crazy Stamper. What are you waiting for??? Have a great start to your weekend. has flown by so fast. actual peoples names on them. other day not knowing what I wanted to do with them……. Volia! 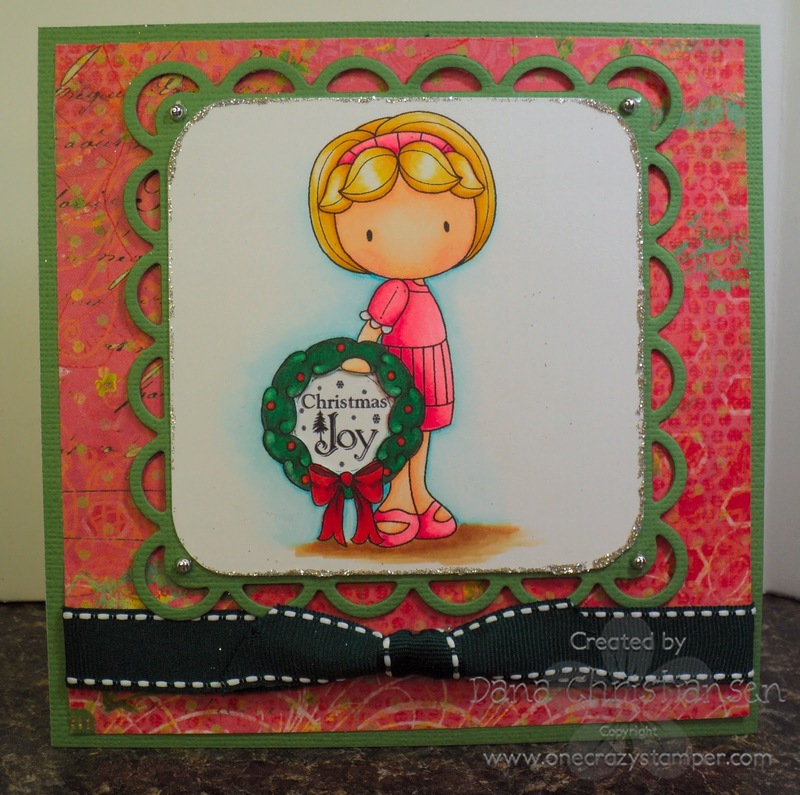 Happy Wednesday everyone and welcome to One Crazy Stamper’s blog. When I saw this image in Lora's store, I just had to have it! It is so sweet! I had so much fun bringing it to life with my Copics. My card is an E-Z fold card and is 5” x 5”. The end result took very little coloring as the image speaks for itself. I also used some of the 6 x 6 Webster’s pages. 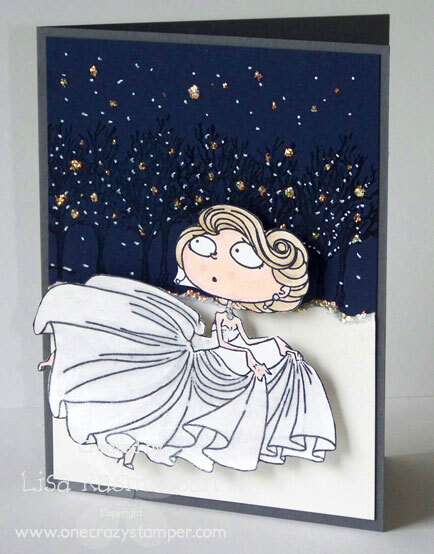 These cardstock weight papers are so rich and beautiful! The 6 x 6 pads are scaled down versions of the 12 x 12, which make them ideal for cards. They are my absolute favorite papers! Spellbinders: Beaded Ovals , Ovals, Scalloped Rectangles and Rectangles. Misc: Stickles, Pearls**, Memento Black Tuxedo Ink, Cuttlebug Embossing folder, 6 x 6 Webster’s pages, Glossy Accents, Oval Punch, and Frost - Sheer Shimmer Mist. ** TIP: In a pinch, if you don’t happen to have the right shade of pearls, color them with copic markers. 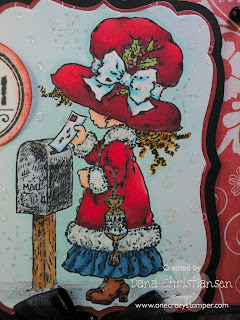 Have you entered a card for the One Crazy Stamper Christmas / Winter challenge? If not, for a chance to win a $25 Gift Certificate, go here to enter – you will have to scroll down to get to the challenge entries. Til next time. 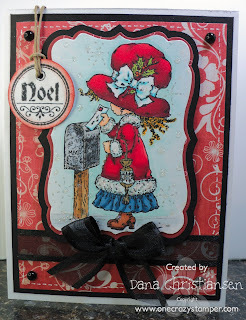 Dana here, and it's my turn to show you some of the beautiful stamps and what not's available at One Crazy Stamper!! I just love this little lady from Stampavie by Sarah Kay. Her name is Noel Joy and she's all dressed up to mail her snail mail!! It was actually a breeze to color her with my Copic markers. I added some doodling around various snowflakes with a Sakura Stardust pen and also to the "fur" on her coat. I just love this paper by Kaiser Craft called "Flutterby". It actually has butterflies which are hidden under the image. I adore flourishes and this deep shade of red actually works really well!! Very shabby chic!! For a final touch I added those black pearls to the corners. I think it frames out the whole card nicely. I actually used my new X-Press It adhesive for the first time on this card and I just love it!! It holds like a dream and requires no effort to tear at all. I also love the fact that when it's all gone the only thing left is a cardboard circle that can be recycled. Don't forget you still have a few more weeks to get in our challenge this month. All you need to do is follow our current theme which is Christmas/Winter. Easy, peasy.. right?? I can't wait to see what you've made!! !